One of my teacher friends recently received this card from a parent. Naturally, the gift was to a restaurant/bar, and I’m confident that she used it happily and gratefully. Teaching is not without its built-in rewards. I’ve been doing this job long enough to have students come back and visit me; send me Facebook messages from college thanking me for what I do (and what I did when they were in my class as seventh graders); tell me out loud, directly to my face how much they enjoyed having me as their teacher. I’ve worked with a myriad of complex, diverse, incredible kids, and many of them have open hearts and a willingness to say thanks…even if it’s a few years later. Their parents are often the same way: Thankful, kind, supportive, and appreciative. And let’s not forget the thrill of seeing a struggling student pass the state-mandated test; go on to do something important and special in their lives; demonstrate growth or understanding of a difficult concept; wave excitedly when they see me in the grocery store. I mean, let’s be realistic: Teachers don’t do this job for the incredible salary, or the benefits, or the retirement plan. We don’t do it for the vacations or the job security (which are both growing less and less guaranteed with each passing year anyway). We teach for the connections and the experience; the playfulness and the fun; the creativity and the love. (And okay, maybe sometimes for the karma.) But we don’t do it for the pay. Occasionally parents and students show their appreciation in concrete ways. And every single time I get a thank you card, or a book, or a mug, I’m surprised and jubilant. (I actually collect mugs. I’m not kidding.) And then there are the gift cards. I don’t have expensive tastes. (I’d better not. I’m a teacher, after all.) And I sincerely love a thoughtful note as much as I do any other gift. I would never treat a student differently if they gave me something, or a particular something for that matter. I don’t remember them differently, or think of them more favorably. And I would never expect anything from any of my students or their parents. 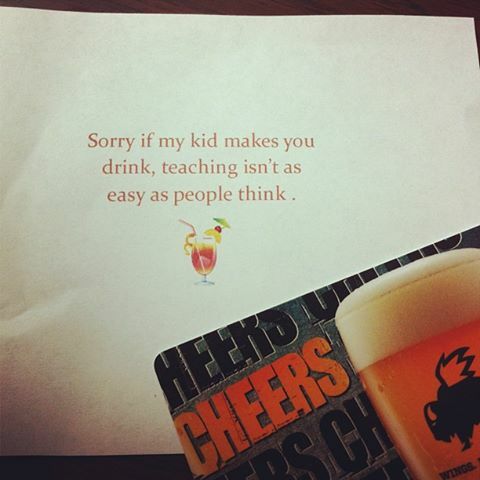 But teaching is also very stressful. And time-consuming. And exhausting. So the beauty of the gift card isn’t that it’s expected or needed. But on those Tuesday nights when I’m working late grading papers; or when I’ve been coaching in the spring and working solid 6-day weeks and I’ve lost my voice for all of the instruction and the talking on the sideline at Ultimate games; or when it’s the end of the month and my bank account is veritably empty…Well, having $10 to spend at my favorite taco place in town is like a fairy godmother. It means a few quiet moments with my boyfriend, when we don’t have to worry about the cost of our meal. It means not having to cook. It means getting off my aching feet and treating myself to some relaxation and reward, without any strings attached or need for justification. It isn’t about the money or the “present,” it’s about the emotional support and the relief. …Which is why I store away these little treats like I’m a squirrel. I know that when those days creep up on me (which they’re sure to do), I’ll have some respite. And in fact, when I find that Alamo Drafthouse coupon, I’m reminded how thankful I am to be a teacher, and to have that rapport with my students and their parents. So the stress and the pressure fall away while I crunch away at my popcorn and watch Ryan Gosling on the big screen. And sure, maybe I’m exaggerating. But last night Jeff and I celebrated the return to school with a Roommate Dinner, and I used a Central Market gift card for ingredients typically outside my teacher budget. While we were toasting our new classes and discussing lesson plans over bacon-wrapped scallops, I was also thinking that in some ways the gift card had come full-circle. That dinner – and the items afforded by the gift – reminded me how very lucky I am. I’d love my job regardless of these little “thank you” presents. But they certainly don’t hurt. This entry was posted on Tuesday, September 3rd, 2013 at 9:22 pmand is filed under . You can follow any responses to this entry through the RSS 2.0 feed. You can leave a response, or trackback from your own site.